Your bedroom is your ultimate inner sanctum where you are at your most vulnerable while you sleep and recharge your chi. From a yin/yang perspective, this is a more yin, quiet and peaceful environment; you need to feel protected and do not want distracting and powerful chi to disturb you. At the same time, there needs to be a good circulation of chi and plenty of fresh air available to recharge you. 1. Ideally, the bedroom should be as far away as possible from the front door, mirroring the practice of our prehistoric ancestors who did not sleep in the mouth of their cave. 2. On entering your bedroom, note where the windows are located. Chi tends to travel between the door and any windows, so avoid positioning your bed in line with this ‘”draught’” of chi. 3. Position your bed so that you can see the door from where you sleep. This gives you a deep sense of inner security. 4. If it is feasible, position your bed as far away from the door as possible. 5. Avoid sleeping with your head close to a window as your chi will dissipate through the window and make you feel more tired on awakening. 6. If you have a bathroom, toilet or shower leading off your bedroom, make sure that the toilet door is always shut while you are asleep. 7. To help you protect your own chi while you are asleep, to internalize it and recharge it, make sure you have a strong, stable headboard. Chi energy enters and exits the body through the feet, hands and the top of the skull. Having a solid “mountain” behind you while you sleep is far more beneficial than a cold, blank wall or worse, the cutting chi of an ornate brass bedstead. 8. If you sleep with another person, note the position of your bed relative to the wall that it is up against. Is it equidistant? In the middle of the wall? This is vital in a relationship as it gives both individuals who share the bed equality in the relationship. A shared bed crammed into the corner of a room, is giving more freedom of chi to the individual on the open side whereas the partner will literally and symbolically feel up against a wall. 9. Make sure all bedside tables have rounded edges and not square to prevent cutting chi being focused towards the occupants. If two sleep in the bed, ensure matching beside tables on either side for added stability and protection in the relationship. Paint the beams; drape fabric over the beams; hang bamboo flutes 2-3 inches below the beam to soften the load (the flutes are hung at a 45-degree angle to the beam with the mouthpiece downwards). 11. If you sleep with another person, make sure your bed is symbolic of this relationship. Beds that are rickety or likely to fall part speak volumes about the state of the relationship. 12. 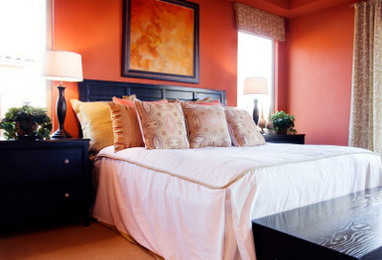 Given that the bedroom is a more yin environment, the lighting that you choose needs to reflect this. Soft lighting is ideal. Avoid having ceiling lamps right directly over your bed. 13. Pastel colors are ideal. 14. Avoid sleeping with your image visible in a mirror. the worst scenario of all is a mirror at the foot of your bed. 15. Place something beautiful that inspires you where you first look in the morning. 16. Pay attention to what is under your bed. Keep the space clear and get rid of any unwanted items there. Adapted from Feng Shui for Life, by Jon Sandifer (Inner Traditions, 2000). Copyright (c) 2000 by Jon Sandifer. Reprinted by permission of Inner Traditions. Adapted from Feng Shui for Life, by Jon Sandifer (Inner Traditions, 2000). Great blog post! I dont understand how long it will require me to obtain through all of them! Though some of this works with common sense, such as positioning for easy traffic flow or avoiding drafts, I'll skip all of the superstition.